Cook and drain peas as directed on box; cool. 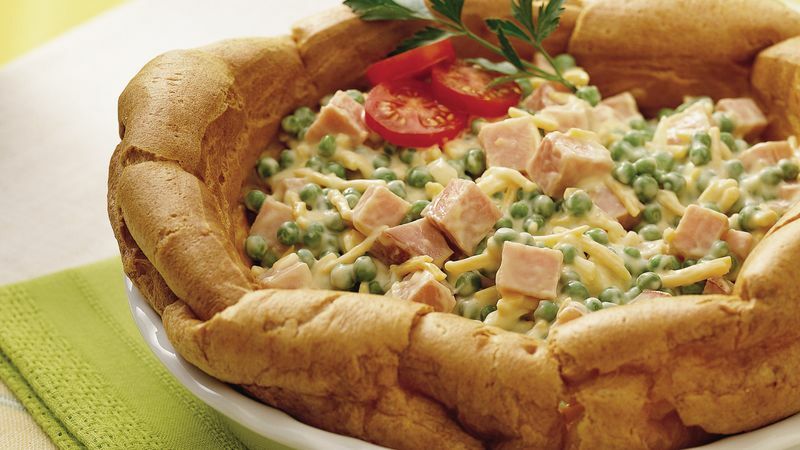 In large bowl, mix peas and remaining salad filling ingredients. Cover; refrigerate at least 1 hour. Heat oven to 400°F. Generously grease bottom and side of 9-inch pie plate with shortening or cooking spray. In 2-quart saucepan, heat water and butter to boiling. Add Bisquick mix all at once; reduce heat to low and stir vigorously over low heat about 1 minute 30 seconds or until mixture forms a ball. Remove from heat; beat in eggs, one at a time, with spoon. Continue beating until smooth. Spread in bottom of pie plate (do not spread up side). Bake uncovered 30 to 35 minutes or until puffed and dry in center. Cool 30 minutes. Just before serving, fill with salad filling. Cut into wedges. Smoked cooked turkey is a good substitute for the cooked ham. In a hurry? Replace the homemade salad filling with your favorite deli salad. You can make the salad "bowl" up to a week ahead. After baking, cool completely, then wrap and freeze. To serve, place on serving plate; let stand uncovered at room temperature about 1 hour or until thawed. Make the salad filling the night before and chill.